We offer a full roof cleaning services, Build up Roof Repair & Paint will clean your roof outside and inside. 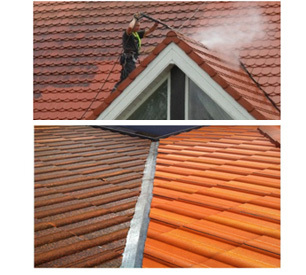 Making roof tiles shine on the outside and ceilings dust free on the inside. All made possible with the latest imported machinery. We will make tile roofs look like new with hi – pressure machinery and industry know how. Build up Roof Repair & Paint will return your unpainted clay and slate tiles to original splendour for a fraction of the cost of paint. Quality roof tiles only start losing their colour after many years and can usually be dramatically improved with a professional high – pressure clean. Our large industrial – strength pressure cleaners removes dirt, pollution stains, moss, fungal and mineral deposits that accumulates over time. Hi – pressure washing makes roofs look like new and decreases future maintenance that might be required from damage caused by blocked gutters and downpipes. Expert pressure washing to flashings, soffits and eaves will also increase their lifespan. Build up Roof Repair & Paint will remove waste deposits that have accumulated over time on the top of ceilings. Using specialised machines and equipment Build up Roof Repair & Paint moves around inside ceilings in order to remove all unsighted, unpleasant and discussing residue with specialised vacuuming machines. Waste mater left by birds, reptiles, rodents, insects nesting, feeding and living in side ceilings. Sand deposits from shrouding mine dumps that contain hazardous ingredients such as arsenic poison. We have also on occasion recovered the remains of the cat that went missing. Waste accumulated in ceilings have been known to cause Hay fever, sinus or allergic reactions. Dust and bacteria from within the ceiling that come in contact with humans place unnecessary strain on immune system. There is a massive health benefit in cleaning your home and business’s ceilings properly. Materials left in ceiling cause deceases and treatment for symptoms are ineffective due to continues exposure to for mentioned infection causing matter. These hazardous matters not only excel the symptoms of Sinus, Asthma and Brongitus but also cause diseases including fungal sinusitis, nasal polyposis, vasomotor rhinitis and other diseases that mimic allergies. The deposits of this hazardous material in the living environment are known to cause sick-home-syndrome. These potentially hazardous materials come in contact with the occupants of the house thru ceiling trapdoors, joints in ceiling, gaps in Cornices joining walls and winds that blow through the roof in to windows and doors. Waste deposits in ceilings are normally confirmed with statements like:“We dust our house daily and tomorrow the dust is back!” Now you know where is it coming from. Improve your family’s health now and book a Build up cleanup.